Citation: C N Trueman "Robert Watson-Watt"
Robert Watson-Watt is credited with inventing the radar which played an invaluable part in the Battle of Britain. Robert Watson-Watt can be considered one of the unsung heroes of World War Two – very many know about his invention, yet few know his name. Robert Watson-Watt was born April 1892 in Brechin, Scotland. In 1912, he graduated with a Batchelor of Science degree from University College, Dundee. After Dundee, Watson-Watt worked with Professor William Peddie and as a result of this work, he developed a fascination with radio waves and what they could do. In 1915, during World War One, Watson-Watt worked as a meteorologist at the Royal Aircraft Factory trying to use radio waves to locate the whereabouts of severe weather (primarily thunder) so that pilots could be forewarned of the potential danger. In 1924, Watson-Watt moved to the Radio Research Station at Slough. In 1927, this organisation joined together with the National Physics Laboratory (NPL) and Watson-Watt became a superintendent within this unit. In 1933, a new radio section of the NPL was created at Teddington and Watson-Watt became superintendent of it. In February 1935, Watson-Watt produced a report entitled “The Detection of Aircraft by Radio Methods”. This report intrigued a committee headed by Sir Henry Tizard. His committee was concerned with air defence. In February 1935, Watson-Watt took part in a successful trial in which short wave radio was used to detect a bomber. As a result of this success, Watson-Watt was appointed superintendent of a newly formed establishment controlled by the Air Ministry – Bawdsey Research Station near Felixstowe in Suffolk. The work done by Watson-Watt and his team at Bawdsey led to the creation of a chain of radar stations throughout the east and south coast of England. This system, known as Chain Home and Chain Home Low, was a vital part of the defence of Great Britain during the Battle of Britain. Fighter Command was given an early warning of an incoming attack by the Luftwaffe and could react accordingly. In 1940, Watson-Watt, assisted by John Randall and Henry Boot of Birmingham University, invented the cavity magnetron. This produced a compact source of short-wave radio waves and allowed Fighter Command to detect incoming enemy planes from a much greater distance given Fighter Command even more time to organise itself in preparation for an attack. The magnetrons were also found to have another use – they could heat up water. Today, magnetrons are used as the source of heat in microwave ovens. For his outstanding work for his country, Robert Watson-Watt was knighted in 1942. In 1952, he was granted £50,000 by the government for services to his country. America awarded him the US Medal of Merit in recognition of the work he had done during World War Two. 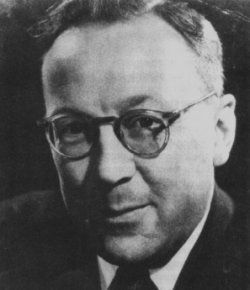 Sir Robert Watson-Watt died on December 5th, 1973. For understandable reasons, the obvious ‘talking points’ of the Battle of Britain are the pilots and the planes that fought in this epic battle. Sir Robert Watson-Watt has been overshadowed by the exploits of the young men who fought in this battle. However, his input into the defence of Great Britain in his country’s hour of need should not be overlooked.